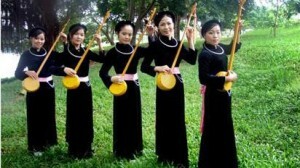 Chiem Hoa district of northern Tuyen Quang province is home to 18 ethnic groups, each with their own special cultures. Among these, arguably the most memorable is Hat then singing – a traditional oratorio of the Tay people. The distinctive musical genre is believed to have been communicated from God to a world in which only two shamans called “Ong Then” and “Ba Then” could understand. During rituals “Ong Then” and “Ba Then” sing and play a musical instrument at the same time while presenting offerings to God, representing the ethnic community to ask for good health, bumper crops, happiness and a long life. In a move to preserve the unique cultural character of Then singing, and to lure more visitors to the district, in recent years Chiem Hoa district authority has held a host of activities to build a cultural-tourism village attached with conserving Then singing. Additionally, the provincial authority has also built a scientific research project, which collects ancient songs and teaches the young generation to sing the songs, thus preserving their cultural values. Of all the talented Then singers in Chiem Hoa district, no one can deny that artisan Ha Thuan is among the greatest. He has spent his entire life with the Then rhythm of the motherland. At 18 years old, he followed his father performing Then songs in neighbouring areas and was taught to play many amazing melodies on the Dan Tinh, a gourd lute. Thuan has worked hard to collect and record all the ancient songs he knows, reworking them to be more melodic. He also translates the songs from the Tay to Kinh language so that young generations will find the lyrics easier to learn and remember. Sharing the same passion as Thuan is 80-year-old Ma Thai Ngoc in Hung My commune. Ngoc says the form of art plays a vital role in the spiritual life of the Tay people in his village. Like Thuan, he has taught tens of people in his village to sing Then songs and play Dan Tinh. According to Deputy Chairman of the district people’s committee Nguyen Hong Ha, as many as 21 Then singing clubs have been established in Chiem Hoa district, thus sustaining the cultural values of the traditional art form. Then singing manifests the aspiration for a wealthy life of the local ethnic people, Ha said, adding that it is a spiritual voice transferring through generations and become a vital part of daily life. Local authorities are now working hard to better preserve this unique cultural art form, he said. Besides Tuyen Quang, Then singing is practised in many northern provinces where Tay ethnic group live, and has drawn the attention of many collectors and researchers over the past decade. In December 2012, the Ministry of Culture, Sports and Tourism added Then singing to the official national intangible cultural heritage list. Application will be submitted to UNESCO in a bid for Then singing to be recognised as a piece of intangible cultural world heritage.